Can you guess from where New Zealand White rabbits were originated? Maybe because their fur that purely snow-white… without the 7-dwarf :D …they’re most often associated as Easter-bunny. The fur is thick around the body, shorter near the ears… long, straight up ears. The eyes normally bright, range from pink to red. They grow fast as initially were “designed” for meat and fur. And later often used for laboratory purposes too. However they are also very popular as pet - the large one, could be 4 to 5 Kg in weight - and often appears in show and contest. 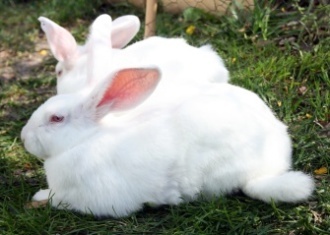 Two New Zealand White bunnies lay down on the grass. The qualities made New Zealand White favorite as pet because the are typically cheerful, friendly, social, outgoing, affectionate, intelligent and trainable. They consider as not biter compared to other breeds, and are easy to play with. Another good thing about them is they seem don't easily get sick or have problems with health as often as others.